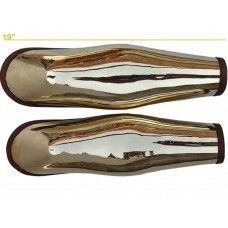 ABS offers large variety of functional greaves in various metals including Stainless Steel & Brass. Our Metal Greaves a best suitable to protect lower part of legs in a battle ground. We produce both open and closed type of greaves. The open greaves comes with inner padding to protect the shin and the closed greaves joined by hinges are made of 2 plates which provides full protection to entire leg.